Roofs are one of those things that people only replace when absolutely necessary. They are a major part of our homes, which, for many people, represent a large investment of financial resources, time, and energy. So if you are shopping for a new residential or commercial roof, chances are your old roof has either been damaged beyond repair by a storm or is just so old that it has stopped performing. Roofs that stop doing their job leak. Leaks go both ways with roofs. Water and heat (or cold) can leak in, or heat (or cold) can leak out. Either one of these situations will cost you money. If your roof is leaking water, you can sustain structural damage that can end up costing you not just the roof repair costs, but replacement costs for any interior furnishings that are ruined. If your roof is leaking air, your heating or cooling bills will go up as your HVAC struggles to keep up. In any case, if you are looking for a Nashville roofing company to replace your roof, you may be wondering if a metal roof is an option for you. If you are wondering if a metal roof is right for you, you probably have lots of questions, and we at Tim Leeper Roofing in Hickory have the answers! In this week’s residential roofing blog, we’ll go over some questions that we often get asked by people who are looking to replace their roof with a metal roof. This is a great starting point for questions! As Tennessee roofing contractors, we repair and install both asphalt and metal roofs, so we know the reason to choose either. Whether you want a metal roof or asphalt depends on what performance you want and what look you are after, as well as other factors such as the location of your home and how much sun the house gets. One other factor is the pitch of the roof. A metal roof requires a 3-in-12 inch rise. If your roof is flatter than that, talk to your roofing contractors for advice. Before we get into performance details, we should acknowledge that a metal roof costs significantly more than an asphalt roof. The metal is a more expensive material, and the installation requires a higher level of craftsmanship, skill, and equipment than does an asphalt roof. But this extra cost is recouped over time in energy savings and its resale value. Up to 90 percent of the cost of a metal roof can be recouped with the sale of the home. Replacing an asphalt roof with another asphalt roof is a quick and inexpensive project. Roofing contractors can replace a damaged or worn-out asphalt roof in a single day. If your prospective roofing company says it’ll take months to perform your roof replacement—or even repair—it’s time to move on to different roofing companies. Heat is, of course, a major consideration when choosing a roof. Asphalt roofs tend to absorb more heat than metal roofs, which are much more efficient at reflecting heat. This heat absorption is a fine quality in the winter, but not so much in the summer. If you have a home that sits under large shade trees, metal could be the perfect material for your home. When the leaves of the trees fall, and the trees are bare in the winter, an asphalt roof heat-absorbing quality can play in your favor. A metal roof can last up to 50–70 years, whereas the average asphalt roof lasts between 20 and 50 years. Or to put this another way, if you get a metal roof installed, you likely won’t have as many (potentially) costly roof repairs. Most metal roofs are made of 25–95 percent recycled material and are, of course, recyclable at the end of their life cycle. Asphalt tiles are disposed of in landfills and add up to 20 billion pounds per year. Metal roofs can be made of a variety of types of metal, including galvanized steel, Galvalume steel, stone-coated steel, aluminum, copper, zinc, terne, and stainless steel. 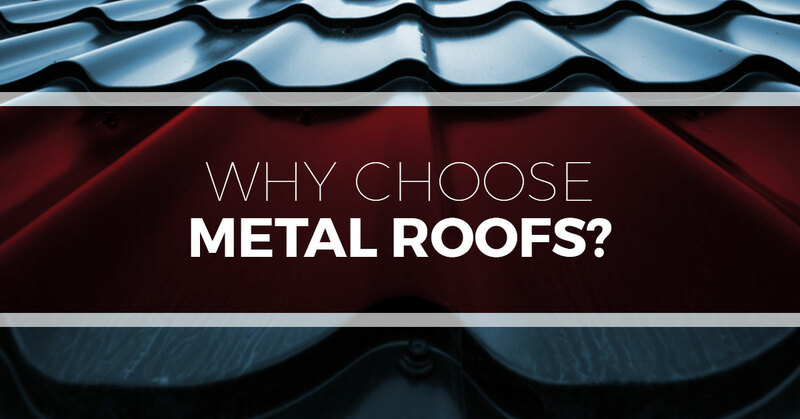 Which metal will be chosen by your roofing contractor depends on the location of your home and your budget. Another feature of metal roofs, the standing seam between panels makes the installation of solar panels easy, opening the door for more energy savings. Nowadays, many roofing companies are striving to choose more environmentally friendly options. If you would like to install solar panels in the future, or want the greenest roofing option possible, express your desires to your roofing contractor. Metal roofs have a higher fire safety rating than do asphalt tiles. They are not subject to catching fire as even the highest fire-rated asphalt roofing material. Metal roofs are inherently resistant to mold, algae growth, and insects. Metal roofs are also impact-resistant so you don’t have to worry that a hailstorm will leave your metal roof dinged up. It would take extremely large hail to make an impact on a metal roof and necessitate a roofing repair. Metal roofs are also strong enough to stand up to hurricane-strength winds, snow, and ice. There are no granules on most metal roofs (see below) so there are none to worry about the loss of. The look you are after with your roof replacement will play a large role in your decision-making process. Your roof should coordinate with the architectural style of your home. It used to be that a craftsman cottage–style home will look much better with a metal roof than a plantation-style home would, but with style advancements this guideline no longer holds. Metal roofs can look like shingle roofs with multiple tiers, for instance, instead of the single long sheet of metal. For these roofs, the metal is formed to imitate Spanish tile, wood shakes, or slate. They can even be coated with granules to give the visual impression that they are asphalt. Because of current style flexibility of metal roofs, the style of the home no longer holds anyone back from having a metal roof if they want one. Whether you now know you want a metal roof or you that you will stick with tried and true asphalt, give Tim Leeper Roofing in Hickory a call for a free estimate. We have earned a reputation for being one of Nashville’s best roofing companies. Whether you need residential or commercial roofing repairs, replacements, or general maintenance, our roofing contractors can handle it!